Students of Texas history rightly stress the importance of the Galveston storm of 1900 as one of the turning points in our state’s history. Political historians point to the reforms in municipal government known as the “Galveston Plan” that followed the disaster. Urban historians point out that that the destruction of Galveston helped Houston become the dominant port of the western Gulf of Mexico. Historians of technology remain fascinated by the construction of the seawall and raising the grade behind that seawall. Texas Methodist history also took a dramatic turn after the Galveston storm of 1900. The most important development was the merger of two MECS churches, Saint John’s and Saint James’s. Since the new church location was between the previous locations at the corner of 19th Street and Ave. I, the church was renamed Central Methodist Church. The magnificent church building was designed to accommodate about 800 to 1000 worshippers by using a sliding partition between Sunday School rooms and the auditorium. The pastor who spearheaded the merger and construction was the Rev. Seth Ward, probably the most prominent member of the Texas Annual Conference of the era. When it came time for the dedicatory service on July 6, 1902, he invited Bishop Eugene R. Hendrix (1847-1927) of Kansas City to come deliver the sermon. Ward knew that he would not enjoy the fruits of his labors in Galveston. Ward had been named assistant missionary secretary. The new position required a move to Nashville. July 6 would mark the last Sunday Seth Ward would serve a local church appointment. In 1906 he was elected bishop, becoming the first native-born Texan to achieve that position. The new preacher, Rev. Eugene R. Crawford arrived on July 13to assume the Central pastorate. In 1906 Central Methodist changed its name to First Methodist Church. The 1902 building served the congregation until 1964. As the building aged, the congregation decided to relocate rather than refurbish. The generosity of Libbie Shearn Moody allowed the congregation to build a strikingly handsome church in a new location (53rd and Ave. U). The name of the church was changed to Moody Memorial at that time. 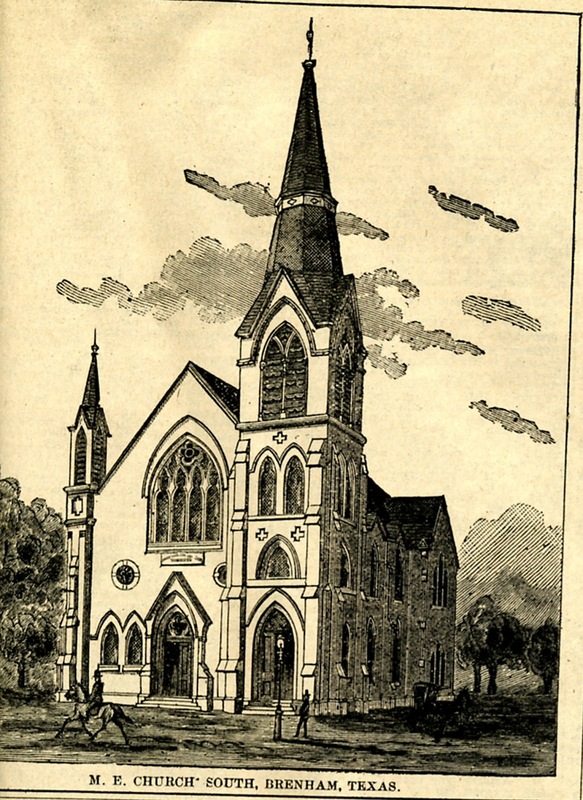 As the system of racial segregation known as Jim Crow strengthened its malignant grip on Texas and the rest of the South in the 1890’s, Methodist churches stepped up to provide not just spiritual, but also institutional support for African American Texans. One such example of that support was Trinity MEC in Houston providing its facilities for the state convention of the state African American teacher’s organization. The opening session of the convention on Thursday, June 27, at 10:30 a.m. demonstrated a blending of church and school themes. W. R. Taylor of Dallas was seated at the church organ. He led the convention in singing, Blessed Assurance. President I. M. Burgan of Paul Quinn College gave an opening prayer which was followed by a welcoming address and by Revive Us Again. Let the Sun Shine In, and America. President Harllee’s address then turned to specific items of interest to teachers. He called equal state support for all schools, adequate funding for Prairie View Industrial College (today’s Prairie View A&M University), and full support for summer institutes for teachers. Such summer institutes were particularly important in an era when many teachers, both African American and white, did not have college degrees. Summer institutes, or “normals”, provided training and professional development for teachers who could not afford full time college work. The presidential address concluded by evoking the importance of the home. It is through the homes, the schools, and the churches that we are to reach the children of the nation. Home, school, church---President Harllee had named the three institutions that were to sustain African Americans through the decades of Jim Crow that still lay ahead of them. Last week’s post highlighted the modernization of Texas towns and cities in the period 1880-1910. Unfortunately all Texans did not participate fully in the progressive measures that helped turn Texas into a modern state. The period in question also witnessed an upsurge in lynching. African American Texans were subjected to a reign of terror in which baseless accusations might lead to most hideous deaths. The Tyler District Conference of the MECS met in Malakoff, Texas, from June 17-21, 1902. The Committee on Resolutions brought forward an anti-lynching resolution and directed the Conference Secretary, the Rev. H. B. Urquart of Murchison to send copies of the resolution to Texas newspapers. Here is the resolution as printed. We note with alarm the growing disposition on the part of some of our people in taking the law in their own hands in dealing with a certain class of criminals whose crime should be nameless. .We deeply deplore this tendency. Our law is adequate and should always be allowed to take its course. Mob law is irresponsible and knows no limit. Resolved 2. We deplore the fact and condemn the crime of lynching wherever and for whatever crime invoked. Two wrongs never make a right. Resolved 3. We urge upon our people the solemn duty to discourage the crime of lynching in any and every possible way. Let us uphold the dignity and majesty of the law, as upon its full enforcement every good thing in our fair land depends. After the Civil War and Reconstruction Era, most sections of Texas experienced a modicum of prosperity. A network of rails crisscrossed the state enabling farmers and stock raisers to sell their products in national and international markets. From about 1880 to 1910 there was a transformation of the built environment. One of the aspects was the construction of magnificent courthouses. Many of those “palaces of justice” still exist and are a point of pride for local comities. They are so important that the Texas Historical Commission has a special program to help counties preserve and modernize those structures. That same period often saw street paving projects, utilities, street cars, and the replacement of wooden commercial structures with masonry ones. Methodists also participated in the transformation of Texas towns and cities. Many of them replaced wooden churches with brick ones. Brenham, the county seat of Washington County, was once such town transformed. On June 10, 1879, while city residents were eagerly awaiting the arrival of the Gulf Coast and Santa Fe Rail Road tracks that would link their town to Galveston, the town turned out for the laying of a cornerstone for the new Methodist church. It was the first brick church of any denomination in the city. The parade started at 3:00 p.m. at Giddings Bank. The parade consisted of local militia, three different fire departments (in the era before municipal fire departments, many cities had mutual self-help fire companies. ), members of the Masonic Lodge, musicians, and orators. They marched to the lot just south of downtown and were seated on improvised seating on the foundation which was already complete. The organ which was to be installed in the new church was already there and used for the ceremony. The main orator was Levin M. Lewis, a Confederate veteran, Methodist preacher, and professor of English as Texas A & M. He was later to become President of Marvin College in Waxahachie. The Presbyterian preacher, W. B. Riggs, delivered the benediction. The shift from wooden to masonry churches meant that churches now had cornerstones. Part of almost every cornerstone laying was depositing items in a box in that stone. Items placed in the Brenham Methodist Church’s cornerstone included a Bible, Discipline, hymnal, copies of newspapers, sheet music for “Sweet Bye and Bye,” and Confederate bonds. Construction proceeded rapidly, and in January, 1882, the church was dedicated, a ceremony which occurs when the structure is debt-free. That status was made possible mainly through the generosity of Mrs. Ann Giddings, who honored her late husband, Jabez Giddings (1814-1878). The church was named in his honor, Giddings Memorial Methodist Episcopal Church, South. 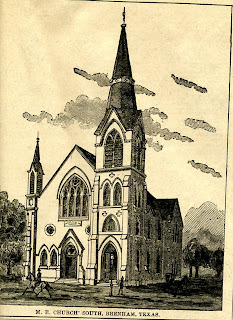 The magnificent church hosted the Texas Annual Conference in 1880, 1886, and 1895. It served until 1938 when the congregation consolidated with the Methodist Episcopal Church. They abandoned the old Giddings Memorial Church building and worshipped in the MEC building. For the last fifty years visitors to Lakeview Methodist Conference Center near Palestine, Texas, have noted the inspiring presence of Peace Chapel on the beautiful grounds. Since peace is such a central concept of Christianity, it would natural to assume that Peace Chapel was named for the main teaching of the Prince of Peace. Peace Chapel is actually the result of the generosity of John R. Peace (1889-1972) and Lillian Stack Peace (1893-1988) of East Bernard in Wharton County. J.R. Peace came to East Bernard to assume the school superintendency in 1915. He was soon elected County School Superintendent, but left to become superintendent of schools in LaGrange, and later Brenham. The family returned to East Bernard in 1926. Although Peace had a bright future as an educator, he became better known as a businessman. In the 1930s he was involved in poultry production. A New Deal program, though, pointed him in a new direction and laid the foundation for prosperity. Lyndon Johnson (another Southwest Texas State Teacher’s College alumnus) was Texas director of the National Youth Administration. The NYA was designed to provide employment and job skills to unemployed youth. Johnson came to East Bernard and arranged for Peace to direct a NYA facility in East Bernard that would train youth in the skill of furniture making. The NYA was discontinued, and the federal government gave the building to the Wharton County commissioners who in turn gave it to the East Bernard schools. In 1947 the school district sold the building to the National Furniture Manufacturing Co., organized by J. R. Peace. Lakeview had already been blessed by the Peace’s involvement. J. R. served as secretary of t the board and contributed for the construction and furnishing of facilities. His grandson’s observation of the lack of a church at church camp led to an historic announcement at the Texas Annual Conference on June 7, 1961. Lakeview Superintendent, Rev. Nace Crawford, introduced J. R. and Lillian to the Conference. They then announced their gift of $75,000 for the construction of a chapel at Lakeview. Construction soon followed, and Peace Chapel was ready for the campers who came to Lakeview in the summer of 1962---exactly fifty years ago.